One of my picks for the Lit Flicks Challenge hosted by Jessica at The Bluestocking Society was The Good German by Joseph Kanon. First I read the book and then several weeks later I watched the movie directed by Steven Soderbergh starring George Clooney, Cate Blanchett and Tobey Maguire. I loved the book and hated the movie. The book sat unread for a few weeks on my coffee table. The size was slightly intimidating. If I were to make a top 10 list of the books I read this year it would be on the list. The book follows Jake Geismar, an American journalist who lived in Berlin before World War II. The story takes place in July and August 1945. Jake is looking for Lena, the married German woman he loves, when he gets caught up in the murder of an American soldier which ties into a hunt for Lena’s husband. The book is full of ideas. Who or what defines a “good German” from a “bad German” during World War II? Before the end of the war, the knowledge of the death camps becomes common amongst German adults. How do the Allies decide who is less guilty of aiding the Nazis? Is the person who wears the Nazi pin and threatens her neighbors just as guilty as the person who drove a truck equipped with a hose from the exhaust pipe to the inside passengers or the scientist who determined how many calories a day were needed to keep Jewish laborers alive? How can a country rebuild itself when the previous government was killing its citizens? Is the person you knew before a war who had to make difficult choices the same person afterwards? It is also full of suspense. Geismar’s discoveries are completed through his various connections. Not a character is wasted. Some appear to be playing more than one side and it isn’t until the end that all of the alliances are revealed. One female photographer served as a sidekick and it was easy to imagine a spunky woman in the movie role. My only complaint is that some information is withheld to keep the reader from reaching the same conclusions as Geismar while information had been forthcoming earlier in the novel. In a movie adaptation the screenwriter has a difficult job. I think the goal for this screenplay was to focus more on the espionage plot than the love story or the ideas in the book. Characters were collapsed into one person (Tobey Maguire’s part was originally two characters in the book) or had screen time but were ignored entirely. The only good thing about this movie is that I rented it from the library so it didn’t cost me anything other than time to see it. During 2008 I saw over a hundred movies and this was not near the top of my list. The book set my expectations too high. After witnessing a portion of the release party for Breaking Dawn I had to read the books for myself to understand what the big fuss was all about. I mostly borrowed the books of a co-worker and I finished Breaking Dawn during the Labor Day weekend. (A lot of the time I read faster than I can type up a review.) Now that Twilight has been released as a movie, here are my thoughts on the series. 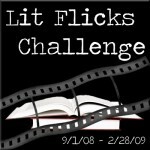 (This qualifies as part of the Lit Flicks Challenge.) Spoilers follow. I know… I know… as you’re reading this you are probably wondering if I ever go to any author readings or if I’m just on the sidelines when movie directors come to town. As a matter of fact, I get to do both; I just haven’t been to an author reading in a while. Last Friday I saw Milos Forman’s first American movie, Taking Off, at the Wexner Center for the Arts. He was there to introduce the film and afterwards he participated in a discussion. I had no idea what to expect from the evening and I must say it was amazing. Going into the event, I had no familiarity with the movie but I knew the basic plot. It was a very funny movie. Early scenes led into later jokes. It was a bit like life in that respect. Someone from the audience asked him which films or filmmakers influenced him. Prior to the war, he’d only seen two movies. The first was Snow White and sadly, he didn’t name the second one. It was a silent black and white movie of Czechoslovakia’s most famous opera. The lights went down, the movie played on the screen and everyone around him was singing it. He thought everyone went to the movies and sang. Milos shared why James Cagney agreed to do the part in Ragtime, seeing Hair performed for the first time on stage, and how it’s preferable to have a Communist government ban a film for life (though it was only twenty years in actuality) than to have the studio heads edit and release a film. It was very much like listening to a beloved uncle or grandfather. The pictures he puts in your head from his stories are even better than what he puts on film. Last Friday (a week ago) I attended a screening of Snow Angels where the director, David Gordon Green, introduced the film and then took questions afterwards. I often recommend his movie, Undertow, to other writers that want to get into a literary frame of mind. Snow Angels is based on the novel of the same name written by Stewart O’Nan. This was the first writing job he’d been brought in to adapt a novel for someone else. As often happens with the movies, some personnel changes happened (such as the director), and Dave picked it up. It was only natural since he knew the material so intimately. Dave’s approach to movies is to use the script as a guideline and allow improvisation. For instance, Sam Rockwell’s last lines in the movie were improvised by Sam. Dave got such a chill from the character that could see a light at the end of the tunnel that it stayed in the final edits. I thought the film showed a softer side to Kate Beckinsale than we’ve seen in a while. Most of the knowledge about her part comes from the experience and worries of being a mom. While Dave, as a single person with no kids, can’t know those experiences and worries, he could create a dialogue with Kate about them. Apparently, Sam Rockwell liked to listen to music between takes. Seeing Dave on stage answering questions, speaking with people afterwards, and getting to meet with him long enough to exchange a few sentences was great. If I wasn’t so conscious of his limited time after the Q&A I would have asked him questions about his literary life such as how many books he reads a year, his favorite authors, did he have a favorite book, and did he ever write any short stories or novels? It’s obvious he enjoys what he is doing. He’s lucky he hasn’t been blocked into only directing or writing a certain type of movie. One thing I noticed about Dave is that he’s an open person. I don’t mean the heart on his sleeve type of open; I mean open to new experiences and people. And if you’re not open to the experience with him, then that’s okay too. I must admit the days have really passed me by. I try to update the site each Monday and before I knew it, Monday had come and gone. Spike Lee was the recipient of the Wexner Prize for 2008 and came into town last Monday to receive the prize and participate in some events surrounding the honor. On Tuesday evening he sat down with his friend, James McBride, for a conversation in Mershon Auditorium which I was able to attend. McBride is in the middle of a book tour to promote Song Yet Sung which he described as about a slave who dreams of the future – of chariots with rubber tires, and inspires a revolt. It certainly got my attention. It was interesting to hear McBride speak about working with Lee on a screenplay. He received a call from Lee while on the road and McBride thought a friend was playing a joke on him. Lee wanted to make a movie from McBride’s Miracle at St. Anna which was on its way to being out of print. This is McBride’s first screenplay. He’d write ten pages, give them to Lee, Lee would make comments and hand them back to McBride. McBride worked on the changes and handed those pages back with ten more new ones. It sounded like there was some give and take. They’re the same age and grew up only a few blocks away from each other in New York which automatically creates a rapport. The movie is planned to be released in October or November 2008. I think it will be a good one based on the trailer I saw. It has an international cast and subtitles. The book is about the 92nd Infantry Division stationed in Italy during World War II. Two of the soldiers presently live in Cleveland. Several times during the evening they were given standing ovations. Harrison Dillard is a four-time Olympic gold medalist. William Perry is most recently noted for raising $30,000 by himself towards the building of a Colonel Charles Young statue. I haven’t read the book so I don’t know if the characters are real people or based on real people. For the movie, four characters are given most of the screen time and they are based on combinations of real people with the imaginations of McBride and Lee thrown into the mix. All four men went to the reception held afterwards. Several people bought copies of the book while walking through the Wexner Center Bookstore and had them autographed by as many of the four as possible. I initially went to hear Spike Lee but I found a new (to me) author and have added more books in my “to be read” pile.